Lemon and Peach green tea looks nice. Multi Tea I think as I need a bit of everything! I'd love to try the T+ Boost Vitamin Tea first. The Boost Tea looks especially appealing. Good to see small companies doing well. raspberry and pomegranate sounds enticing! 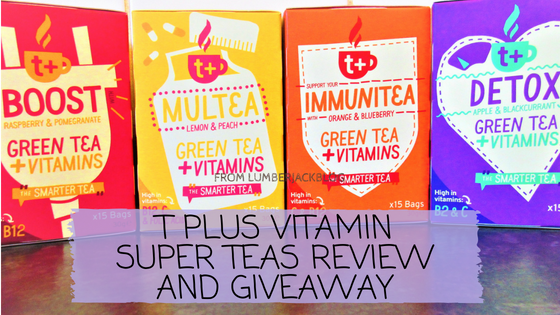 I would love to try the T+ Boost vitamin infused energy tea first! I really need to try the Immunitea at the minute! raspberry and pomegranite would be first! The Raspberry and Pomegranate sounds amazing! Although they all sound lovely. I’d love to try the T+ Boost Vitamin Tea first. The Lemon and Peach...i think id quite like them as iced tea too! I’m a big green tea fan so I would try the green tea with vitamins. I would love to try the lemon and peach tea first! I've tried some before but I haven't had the lemon & peach before!